For years, the foundations of cancer treatment were surgery, chemotherapy, and radiation therapy. But over the past several years, immunotherapy—therapies that enlist and strengthen the power of a patient’s immune system to attack tumors—has emerged as what many in the cancer community now call the “fifth pillar” of cancer treatment. T cells are immune system cells that play several key roles in the body’s fight against the disease. They help the immune system respond to a disease and directly kill diseased cells. Unfortunately, naturally occurring T cells are not good at recognizing and fighting cancer cells. Chimeric antigen receptors (CARs, also known as chimeric immunoreceptors, chimeric T cell receptors, artificial T cell receptors or CAR-T) are engineered receptors which graft an arbitrary specificity onto T cell, these receptors are used to graft the specificity of a monoclonal antibody onto a T cell, with transfer of their coding sequence facilitated by retroviral vectors. The receptors are called chimeric because they are composed of parts from different sources. CAR T-cell therapy is a type of immunotherapy that changes a patient’s own T cells so they are able to recognize and attack cancer. T cells are taken from a patient’s blood. Then the gene for a special receptor that binds to a certain protein on the patient’s cancer cells is added in the laboratory. Which cancers can be treated with CAR-T cell therapy? After years of clinical trials, in 2017, the Food and Drug Administration approved the use of two CAR T-cell therapies. Both use genetically modified cells that recognize a protein (called CD-19) on the surface of cancerous B cells. 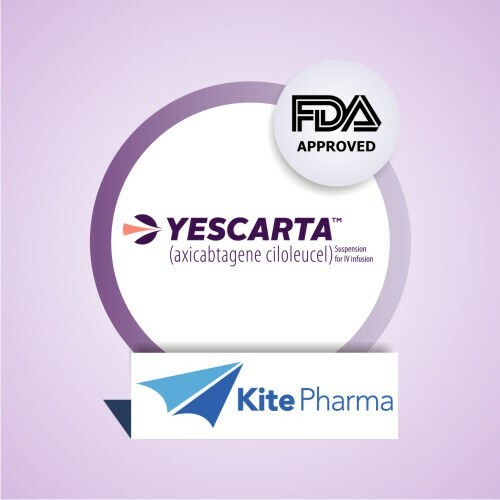 Yescarta has been approved for patients with large B-cell lymphoma that has relapsed or does not respond to standard treatments. Kymriah is for pediatric and young adult patients age 25 or younger with B-cell acute lymphoblastic leukemia. To be eligible for either treatment, patients must have been treated unsuccessfully with at least two other cancer therapies. CAR T-Cells are more effective on the hematologic tumor. There is some skepticism that CAR T cells will have the same success in solid tumors. Efforts to identify unique antigens on the surface of solid tumors have largely been unsuccessful. Researchers estimate that the overwhelming majority of tumor antigens reside inside tumor cells, out of the reach of CARs, which can only bind to antigens on the cell surface. Many tumor-associated antigens were targeted to get the optimal efficacy already, such as epidermal growth factor receptor (EGFR) and EGFR variant (EGFRvIII), Interleukin 13 receptor α2 (IL13Rα2), HER2, and so on. Early reports from these trials, however, have not reported the same success that’s been seen with blood cancers. Another key obstacle to solid tumors is that components of the microenvironment that surrounds them conspire to blunt the immune response. T cells must be able to traffic to tumor sites in order to exert their effector functions in vivo. Extracellular matrix (ECM) is the main barrier to transport, which contains the heparan sulfate proteoglycans (HSPGs), the main component of ECM. T cells must get rid of the obstacle of HSPGs in the stroma-rich tumor microenvironment to reach tumor sites. However, T cells have no ability to express the enzyme heparanase (HPSE) to degrade heparan sulfate proteoglycans. Therefore, CAR-T cells that can secrete heparanase are engineered, which can promote infiltration and antitumor activity. As a result, against solid tumors may require a “super T cell,” or other forms of ACT may be better suited for solid tumors. 1. Collected T cell from patient. T cells are collected via leukocyte apheresis. The leukocytes are removed using a blood cell separator. The patient’s autologous peripheral blood mononuclear cells (PBMC) are then separated and collected from the buffy coat that forms. The remaining blood is then returned to the body. 2. T cell activation. The products of leukocyte apheresis are then transferred into a cell processing center. In the cell processing center, specific T-Cells are activated in a certain environment in which they can actively proliferate. The cells are activated using a type of cytokine called an interleukin, specifically Interleukin 2 (IL-2) as well as anti-CD3 antibodies. 3. T cell reengineering. The T cells are sent to a laboratory or a drug manufacturing facility where they are genetically engineered, by introducing DNA into them by either an integrating gammaretrovirus (RV) or by lentivirus (LV) vectors, to produce chimeric antigen receptors (CARs) on the surface of the cells. These vectors are very safe in modern times due to a partial deletion of the U3 region. 4. T cell multiplied. Genetically modified T cells are “expanded” by growing cells in the laboratory. When there are enough of them, these CAR T cells are frozen and sent to the hospital or center where the patient is being treated. 5. CAR-T cells thaw and infusion. The patient undergoes lymphodepletion chemotherapy prior to the introduction of the engineered CD CAR T-Cells. The depletion of the number of circulating leukocytes in the patient upregulates the number of cytokines that are produced which help to promote the expansion of the engineered CAR T-Cell. CAR T cells that have been returned to the patient’s bloodstream multiply in number. 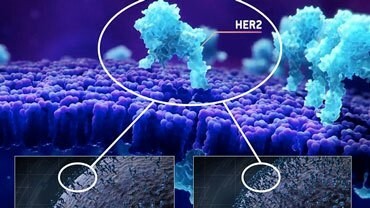 These are the “attacker” cells that will recognize, and attack, cells that have the targeted antigen on their surface. 6. CAR-T cell against recurrence. CAR T cells may eradicate all of the cancer cells and may remain in the body months after the infusion has been completed. The therapy has resulted in long-term remissions for some types of blood cancer. CARs are composed of three regions: the ectodomain, the transmembrane domain and the endodomain. The ectodomain consists of 3 components: a signaling peptide, an antigen recognition region and a spacer. The signal peptide directs the nascent protein into the endoplasmic reticulum. 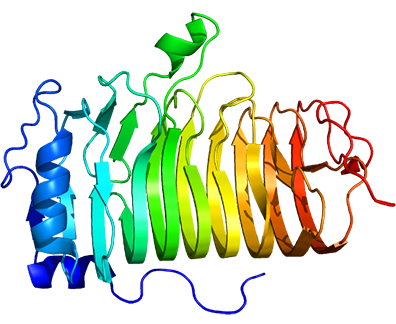 The antigen recognition region in CAR is called a single-chain variable fragment (scFv), a type of protein known as a fusion protein or chimeric protein. 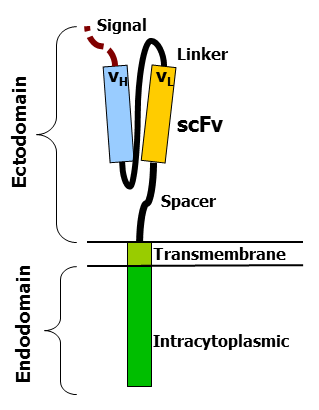 A scFv is a chimeric protein made up of the light and heavy chains of immunoglobins connected with a short linker peptide. The linker consists of hydrophilic residues with stretches of glycine and serine in it for flexibility as well as stretches of glutamate and lysine for added solubility. The transmembrane domain is a hydrophobic alpha helix that spans the membrane. The transmembrane domain is essential for the stability of the receptor as a whole. At present, the CD28 transmembrane domain is the most stable of the domains. Endodomian is the functional end of the receptor. 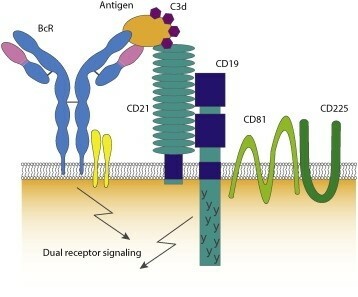 After antigen recognition, receptors cluster and a signal are transmitted to the cell. 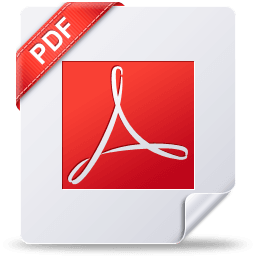 The most commonly used endodomain component is CD3-zeta which contains 3 ITAMs. This transmits an activation signal to the T cell after the antigen is bound. With the development of co-stimulatory molecules, CAR-T cells have experienced four generations of development. Many co-stimulatory molecules have been investigated, including CD28, 4-1BB (CD137), CD27 and OX40 (CD134), which have been incorporated into CARs to further enhance the therapeutic effect. First generation CARs only have a CD3ζ signaling domain to provide an activation signal, but the expansion ability and anti-tumor efficacy are unsatisfactory. Subsequently, second-generation CARs have a costimulatory signaling domain to enhance the signal function of the CD3z signaling domain. CAR-T cells with CD28 or 4-1BB signaling domain have shown potent anti-tumor efficacy in vivo for B cell malignancies. ICOS co-stimulatory domain also has been used and CARs with ICOS tend to have enhanced survival time than CARs with CD28 or 4-1BB co-stimulatory domain. In third generation CARs, two costimulatory signaling domains are added to amplify the anti-tumor effect of second-generation CARs. CAR-T cells with CD28 and 4-1BB domains have shown enhanced functionality and increased persistence. In addition to these co-stimulatory molecules mentioned above, some other molecules are also being studied, such as CTLA-4 or PD-1, preventing the damage of inadequate T cell specificity to normal tissues. Stimulatory killer immunoglobulin-like receptor (KIR) KIR2DS2 and DNAX-activating protein of 12 kDa (DAP12) also are used to replace CD3z and co-stimulatory molecule to enhance the proliferation and function of CAR-T cells, which can destroy immunotherapy-resistant solid tumors efficiently. While in the fourth generation CARs (TRUCKs), cytokine genes are added, and these CAR-T cells modified with cytokine genes can use some valid components of the tumor microenvironment to amplify anti-tumor efficacy. 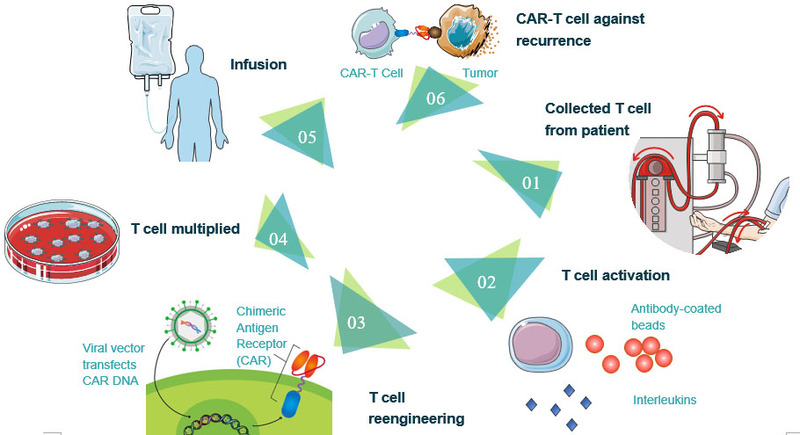 The identification of targets happens before and is a prerequisite of CAR-T cell therapy. In order to avoid damage to healthy tissues caused by CAR-T cell therapy, the targets must be restricted to tumor cells. So far, a variety of tumor-associated antigens (TAAs) have been targeted to achieve an ideal therapeutic effect. However, it is quite difficult to discover an ideal biomarker as an anti-tumor target, which highly expressed on tumor cell surface and rarely expressed on the healthy cell. In a more common situation, the chosen biomarkers express on both tumor cell and healthy ones, with a significant expression level discrimination. That is why we should pay close attention to the on-target-off-tumor cytotoxicity of CAR-T cell therapy. The cluster of differentiation 19 (CD19) is regarded as a star biomarker in the area of CAR-T therapy. Besides CD19, other biomarkers targeting numerous different types of tumor cells are used as CAR-T targets for clinical trials. We will introduce some of the target antigens here. 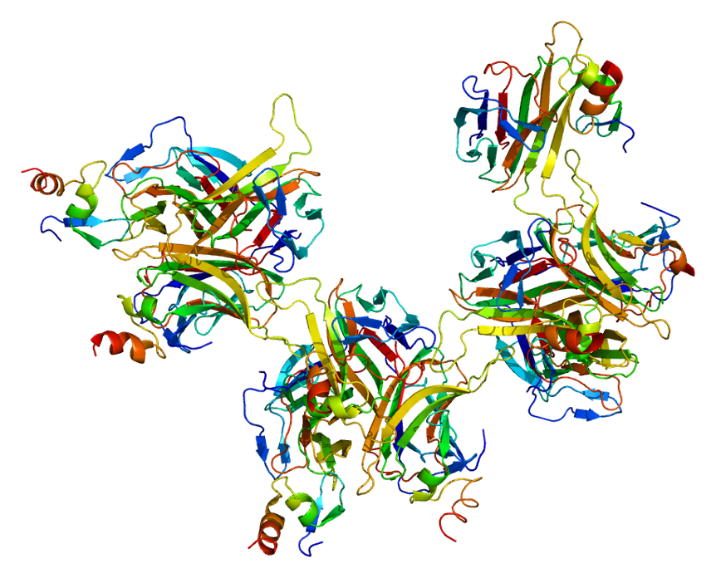 The human CD19 antigen is a 95 kD transmembrane glycoprotein belonging to the immunoglobulin (Ig) superfamily. CD19 is classified as a type I transmembrane protein, with a single transmembrane domain, a cytoplasmic C-terminus, and extracellular N-terminus. CD19 is critically involved in establishing intrinsic B cell signaling thresholds through modulating both B cell receptor (BCR)-dependent and independent signaling. It plays roles in the antigen-independent development as well as the immunoglobulin-induced activation of B cells. CD19 is thus critical for the body to mount an optimal immune response. On B cells, CD19 associates with CD21, CD81, and CD225, forming a signal transduction complex. Expression of CD19 is found in the majority of B cell-derived malignancies, as well as on follicular dendritic cells. The CD19 antigen plays an important role in clinical oncology. CD19-targeted CARs to treat B cell cancers are up to 70%–90% response rate in acute and chronic leukemias. Although the great success with CD19 specific CARs, CD19 escape variants have been confirmed after therapy and responding patients with subsequent target loss have a recurrence of the disease. To overcome such antigen target issues about escape variants, one method is to investigate other tumor antigen targets, such as CD22, CD20, CD138, CD33, CD123, and so on. CD20 was discovered in 1980 as the first specific B-cell marker. It is a non-glycosylated tetraspanin of the membrane spanning 4-A family, with two extracellular loops. CD20 is expressed on the surface of all B-cells beginning at the pro-B phase (CD45R+, CD117+) and progressively increasing in concentration until maturity. It is suspected that it acts as a calcium channel in the cell membrane and is thought to modulate calcium release arising from the BCR. Importantly, as well as being expressed on normal B-cells, CD20 was also found to be expressed on the surface of malignant B-cells. It is highly expressed, with approximately 100,000 CD20 molecules expressed on the surface of most malignant cells. B-cell maturation antigen (BCMA or BCM), also known as tumor necrosis factor receptor superfamily member 17 (TNFRSF17), is predominantly expressed on terminally differentiated B cells and, upon bin ding to its ligands B cell activator of the TNF family (BAFF) and a proliferation-inducing ligand (APRIL), delivers pro-survival cell signals. Thus, BCMA is most known for its functional activity in mediating the survival of plasma cells that maintain long-term humoral immunity. The expression of BCMA has been also linked to a number of cancers, autoimmune disorders, and infectious diseases that suggest additional roles for BCMA activity. BCMA is expressed on a number of hematologic malignancies, such as Hodgkin’s and non-Hodgkin’s lymphomas. BCMA could maintain the viability and proliferation of malignant cells. BCMA expression is also found in both primary tumor cells and cell lines of multiple myeloma. A critical role for BCMA in protecting myeloma cells from apoptosis. BCMA-specific antagonists may have significant clinical benefit for BCMA-expressing cancers. Receptor tyrosine-protein kinase erbB-2, also known as CD340 (cluster of differentiation 340), proto-oncogene Neu, Erbb2 (rodent), or ERBB2 (human), is also frequently called HER2 (from human epidermal growth factor receptor 2) or HER2/neu. HER2 is a non-ligand-binding member of this family and exerts its activity through heterodimerisation with other EGFR family members. HER2 functional activation promotes oncogenesis. More recently, somatic HER2 gene mutations have been detected in a range of human cancer types. Amplification, also known as the over-expression of the ERBB2 gene, occurs in approximately 15-30% of breast cancers. It is strongly associated with increased disease recurrence and a poor prognosis. Over-expression is also known to occur in ovarian, stomach, adenocarcinoma of the lung and aggressive forms of uterine cancer, such as uterine serous endometrial carcinoma. To overcome target antigen escaping variants, except investigating other tumor antigen targets, the other method is the concepts of double CARs or dual receptors within one T cell, switchable CARs mentioned above also can be used here to prevent the development of antigen escape variants. As of August 2017, there were around 200 clinical trials happening globally involving CAR T-Cells. Of those trials, around 65% were trials in which haematological malignancies were explored, and 80% of them involved CD19 CAR T-Cells targeting the B-cell cancers. Studies had begun by 2016 to explore the viability of other antigens such as CD20. CAR-T clinical trials have shown huge remission rates, of up to 94%, in severe cancer types. This is particularly impressive considering most CAR-T clinical trials recruit cancer patients that have not responded to many if not all other available treatments. These results have fed the expectations of patients and investors alike, but it’s important to remember that the therapy can also have flaws. Like all cancer therapies, CAR T-cell therapy can cause several worrisome, and sometimes fatal, side effects. As part of their immune-related duties, T cells release cytokines, chemical messengers that help to stimulate and direct the immune response. In the case of CRS, there is a rapid and massive release of cytokines into the bloodstream, which can lead to dangerously high fevers and precipitous drops in blood pressure. CRS symptoms can range from mild flulike symptoms that include nausea, fatigue, headache, chills and fever to more serious symptoms, such as a low blood pressure, tachycardia (abnormally rapid heart rate), capillary leakage (fluid and proteins leak out of tiny blood vessels and flow into surrounding tissues, resulting in dangerously low blood pressure), cardiac arrest, cardiac arrhythmias, cardiac failure, hemophagocytic lymphohistiocytosis (life-threatening immunodeficiency)/macrophage activation syndrome (life-threatening complication of rheumatic disease) (HLH/MAS), hypoxia (lack of oxygen reaching the tissue), renal insufficiency (poor function of the kidneys), poor lung oxygenation and multiple organ failure. Ironically, CRS is considered an “on-target” effect of CAR T-cell therapy—that is, its presence demonstrates that active T cells are at work in the body. Neurologic Toxicities. Common symptoms include language impairment (aphasia), confusion, delirium, involuntary muscle twitching, hallucinations, or unresponsiveness. Seizures have also been reported. B-Cell Aplasia. CAR T-cell therapy targeting antigens found on the surface of B cells not only destroys cancerous B cells but also normal B cells. CD19 is also expressed on normal B cells, which are responsible for producing antibodies that kill pathogens. These normal B cells are also often killed by the infused CAR T cells. To compensate, many patients must receive immunoglobulin therapy, which provides them with the necessary antibodies to fight off infections. Tumor Lysis Syndrome (TLS). A group of metabolic complications that can occur due to the breakdown of dying cells - usually at the onset of toxic cancer treatments. Anaphylaxis (Life-threatening Allergic Reaction). There is potential for a patient receiving CAR-T cell therapy to have an overwhelming immune response against the CAR itself, called “anaphylaxis.” Symptoms associated with anaphylaxis include hives, facial swelling, low blood pressure and respiratory distress. While these are the known side effects, CAR T-cell therapy is a new treatment and doctors continue monitoring patients to uncover any long-term impact on their bodies.